Key Topics:Internet of things, interaction design, product design, manufacturing, strategy, policy, entrepreneurship. 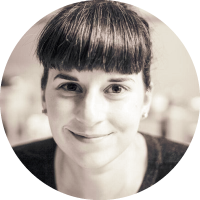 Alexandra is an internet of things consultant with an interaction & product design background. She is also the founder of the Good Night Lamp, a family of internet-connected lamps for your global friends and family which is made in the UK. She was the first UK distributor of the open-source electronics platform Arduino. Her work has been exhibited at the London Design Museum, Museum of Modern Art in New York, the Victoria & Albert Museum and galleries around the world. She also runs the London Internet of Things meetup since 2011, the world’s second largest dedicated meetup on IoT. I moved to the UK and became the first distributor of the Arduino. I grew that business to include training and design services. I’ve always been interested in the role of design in how we shape #iot but also the ethical consequences of designing embedded invisible technologically-enabled products. As I developed the Good Night Lamp I also developed business and technical competencies that help me have a very complete picture to my clients of what is the journey of building connected product experiences. I was asked in 2011 to grow the internet of things community in London and I’ve curated it since. We now have over 11K members and it’s explosed me to many startups and corporate projects in this space. I’m also now writing a book on smart homes for Apress as I think there are a lot of important lessons I can share around designing connected experiences for the home space. Along with a community of practitioners across the UK & EU, I’m helping build a certification mark for #iot to give consumers choice and certainty in such a fragmented space. Kevin Ashton who coined the term in 2001 and David Rose who was the founder of Ambient Devices, the first connected product business. I’m interested in art and architecture of the 1920s-1940s as an example of what diverse communities can achieve together. Buckminster Fuller, Isamu Noguchi, Lee Miller, Christine Frederick are all people who had an impact on the way we see the built world. I’m also a fan of E.F. Shumacher’s work in economics, I don’t think enough designers read or care about economics, but design is fundamentally an economic-focused activity. User-centered design is usually going to help companies sell more things to people. We don’t have enough conversations about the ethics of that relationship. I’m very interested in building practices too. I’m looking forward to attending a workshop in California by Calearth who teach people sustainable building practices using natural materials. I’m excited about what companies like IKEA and Bosch can do. They are structured very differently to web or tech companies and that has an influence on the take they have on #iot. You can email me on work@designswarm.com, drop me a message via Twitter or on LinkedIn or through the website here: designswarm.com/services.